Dr. Carlos Cardenas, CEO of Doctors Hospital at Renaissance signs agreement with The University of Houston College of Pharmacy to bring satellite program to the Rio Grande Valley. Photo by Carlos Sanchez. 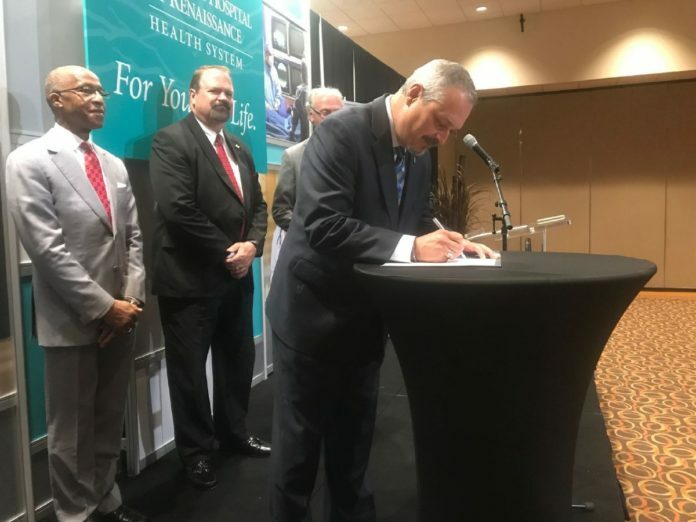 EDINBURG —The University of Houston College of Pharmacy formalized an agreement with Doctors Hospital at Renaissance on Tuesday to bring its first satellite program to the Rio Grande Valley. The program is intended to draw from a 2015 memorandum of understanding with South Texas College aimed at creating a pathway for students to attain a doctor of pharmacy degree through The University of Houston. Students who have already received a bachelor’s degree in the area could apply for the doctorate program which would require them to complete their first three years in Houston and return to the Valley during their fourth year to complete course and clinical or residency requirements. During this last year of the program, DHR will provide classroom space as well as office space for university faculty and staff, Pritchard said. The goal is that by providing opportunities locally, these students will remain in the area to practice. “Students who do their advanced training in a certain area tend to stay in that area, and that will help lay the clinical pharmacist shortage that we are still seeing in the Rio Grande Valley,” said Lamar Pritchard, dean of the college of pharmacy at the University of Houston. The university has a history of attracting students from the Valley, he said, but because the numbers tend to be low — about four to nine students per class out of 125 students — and the need in the area is greater, the intention is to increase these numbers per year and have a more established cohort and satellite program in the next five years. At the moment the university is in the process of hiring an assistant dean who will be in charge of the program and based out of Edinburg, Pritchard said. They expect to finish the search by the end of the summer to begin training in areas such as research methodology. A cohort of students that will begin their fourth year in the Valley has already been identified and is expected to be in the area in about six months. As the program grows, university officials are also identifying other opportunities to expand into the Rio Grande Valley, which with the recent opening of the University of Texas Rio Grande Valley School of Medicine could be seeing a boom in opportunities in the health sectors.